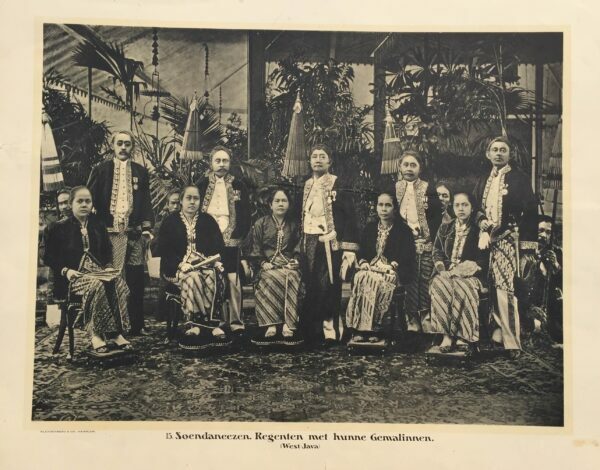 Sundanese regents and their consorts, West Java. One of Java’s predominant indigenous cultures has always been the Sundanese. They numbered about seven million in 1911. Most Sundanese lived in the mountain forests, far from the influence of Hinduism which penetrated Java in prehistoric times. Later, however, Islam penetrated their domain and the Sundanese became even more fervent Muslims than some other ethnic groups. Nevertheless, the ancient Sundanese traditions remained strong. Rank was of great importance as it was in many of the islands traditional cultures. The fold of the ladies’ sarongs and the men’s headdresses, the umbrellas and the embroidery of the jackets, which reveal some European influence (like the fans on the laps of the ladies), indicate the group in this plate were Sundanese regents and their consorts. Taken c.1895 and published in Holland between 1912 and 1914.